More than 35 years ago Molly Moore took a simple but dramatic step. She gave five dollars to Dalhousie Medical Research Foundation (DMRF). While not a woman of great means, she believed that if everyone made a gift to support medical research, together we could make a big difference. Molly's remarkable first step inspired DMRF to launch the annual Molly Appeal campaign in her honour. Molly continued to give what she could throughout her life. 100% of every gift to the annual Molly Appeal supports medical research at Dalhousie Medical School right here in the Maritimes. Molly's commitment continues to inspire thousands of people to give to the annual appeal, which has raised over $5 million to date. Dalhousie Medical Research Foundation’s 2018-19 Molly Appeal will provide matching funds to allow Dalhousie Medical School to acquire a very important new piece of equipment that will be used by researchers in dozens of labs at Dalhousie Medical School. 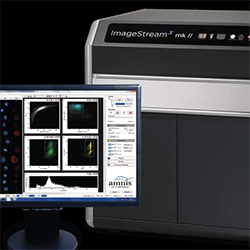 The equipment is the ImageStreamX Mark II, a state-of-the-art hybrid instrument that combines microscopic visualization of individual cells with the ability to analyze five thousand cells per second by flow cytometry (high-speed cell sorting). Conventional cell-analysis equipment only allows researchers to look at cells as groups, to see what is happening in populations of cells “on average.” The ImageStreamX Mark II will allow the researchers to isolate individual cells that exhibit unusual behaviours. These rare cells may be the keys that unlock the secrets of many diseases and lead the way to new cures. The ImageStreamX Mark II will be a powerful discovery tool. It will allow Dalhousie medical researchers not only to better understand cellular and microbial processes in health and disease, but also to identify targets for new therapies and monitor the effects of experimental and existing drugs on a wide range of diseases. Dalhousie Medical School's researchers are passionate in their pursuit of answers. New Faces of Molly, they are making critical discoveries that are bringing us closer than ever to lasting cures for a wide range of devastating diseases and conditions. In so doing, they are truly taking Molly’s mission into the 21st century. The new Faces of Molly include Dalhousie Medical School’s researchers, striving for cures with support from Dalhousie Medical Research Foundation donors.